Salestracker now integrates with Google Maps to provide a richer experience and better information for sales and marketing people. Salestracker enables you to view customer data, prospects or sales leads, or to segment and build data sets for in-depth market analysis using the powerful ListBuilder tool. Use it to view individual records, or plot multiple contacts on a map. 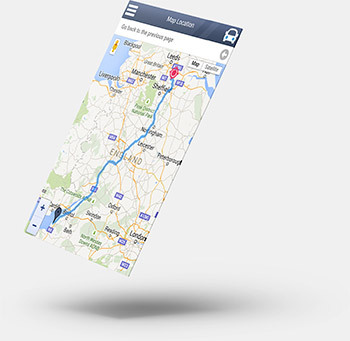 With dedicated map icons for records, sales leads and relationships (such as customers or prospects), salespeople and internal staff will also find it an invaluable addition to help with booking appointments, organising deliveries and planning journeys. Click a map icon to get the company details, then click the company name to view the full record. Salestracker mobile uses the latest geo-location technology natively built into mobile devices alongside Google Maps to help field-based sales people or other staff get better organised. View records, sales leads and customers/prospects on a map, then click the icon to get company details and driving directions from your current location. Nearby is a powerful tool on Salestracker Mobile that uses location based technology to plot all the records in close proximity to your current location. Users can individually set their own preferences to display contacts per database, relationships, leads, favourites and even distance from current location.